A LUXURY CABIN WITH A SPECTACULAR VIEW IN PRESTIGIOUS BEAR CREEK CROSSING RESORT - A MOUNTAIN TOP View! LUXURY Professional Decorated Log Cabin with a Spectacular Mountain View in GATED Bear Creek Crossing Resort. 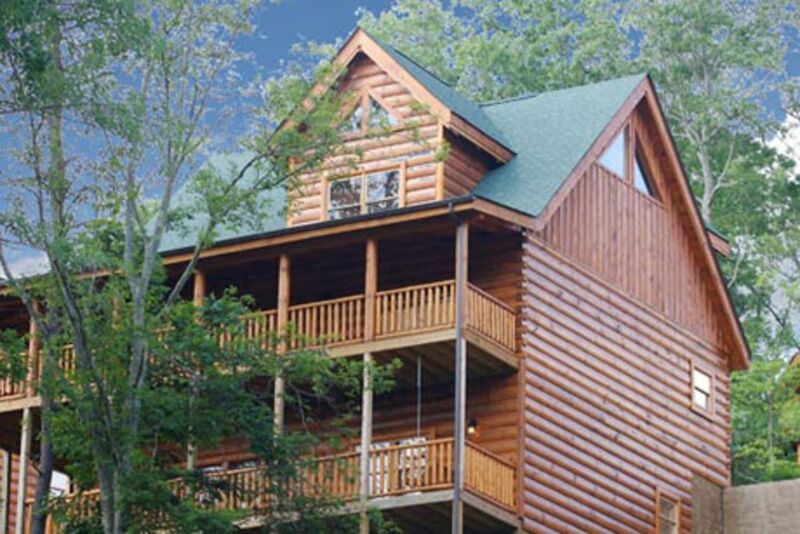 This Luxury 4-Bedroom Log Cabin sleeps 12 and has 4-1/2 baths. Each Bedroom has a KING SIZE BED, its own Private Full Bath and an HDTV. Cabin has a Queen-size sofa sleeper. Master Suite with Bedside Jacuzzi, & Huge Master Bathroom. Fantastic Game Room with Custom Handmade Wooden POOL TABLE, two (2) VIDEO ARCADE GAMES each w/ 100 games and FREE Play, 50' HDTV with Surround Sound System, board games, toys, books, & OVER 175 DVD MOVIES. Great Room w/ Cathedral Ceiling, 60'' Widescreen HDTV with Blu-Ray Player with Surround Sound System, 2 Outside Large Decks & New Private HOT TUB w/ changing color lights, lots of Country Rockers & Porch Swing, and 2 BBQ Gas Grills. A 50' HDTV in MASTER Bedroom, plus 32' HDTV's in the other 3 bedrooms. Indoor & Outdoor Resort Pools, Free Miniature Putt-Putt Golf, FREE 'Wi-Fi' Internet access. Cabin is approx. 3,000 sq ft. Dollywood about 15 Minutes AWAY! ! WOOD CABIN PLAY HOUSE for the little kids! BEST ENTERTAINMENT VALUE and LOWEST PRICED 4 BEDROOM LOG CABIN with the MOST AMENITIES in BEAR CREEK CROSSING RESORT!! Entertainment Value: 2 - 50 inch HDTV's, 1 - 60 inch HDTV and 3 - 32 inch HDTV's ALL with DVD PLAYERS; 2 - Surround Sound Systems, DishNetwork SATELLITE TV in the Cabin!! Plus over 175 DVD movies. 2 - Multi-Player Video Arcade Games with 100 games each (FREE Play), PROFESSIONAL POPCORN MAKER, POOL TABLE, Books, Board Games, and TOYS to keep the kids busy! NEW MINI WOOD CABIN PLAY HOUSE to keep the Kids Busy on the Bottom Deck - WOW!!! Why spend tons of quarters in town when video arcade games are FREE PLAY in the cabin, have a movie or game night right here in the cabin??? Guests seem to rather stay and play in the cabin than spend hundreds of dollars in town on entertaining the family. Great way to save a lot of entertainment money and yet have a great vacation. During the Summer High Season weekly rentals are from a Friday to Friday, or Sunday to Sunday ONLY!! John and I have been in the rental business since 2004 and have many repeat guests. We currently live in Atlanta but are from Chicago. This chalet was the 2nd of our 5 properties which we purchased. We fell in love with this chalet the moment we saw it. The beautiful mountain view, tranquility along with being only 5-10 minutes from the action on 441 of Pigeon Forge. It's a large cabin with plenty to do but only 5 miles from the action! Location Location Location. It's in a gated resort community with FREE mini golf, indoor outdoor pool and waterfall. It's luxury in the woods! Hot tub, jacuzzi, arcade games, 200 DVD's, HDTV's in all rooms. Or relax and sip your morning coffee on the swing or on one of the many rocking chairs as you look at the mountains and hear the birds sing. 4 private baths in each bedroom professionally decorated top quality fixtures. Master bath is huge with closet in bathroom, shower, bedside Jacuzzi. Master bath is so large it can be a spare bedroom!! Ceramic tile throughout with romanctic atmosphere. Well decorated top quality furniture. Half bath off of large fully equipped CHEF's country kitchen with all utensils, upscale trio crock pots, blender, large refrigerator, stove, microwave and dishwasher. A must see! Spectacular mountain view with forest in front of cabin. Plenty of parking. A quality LOCATION LOCATION LOCATION LUXURY LOG HOME CHALET. Decorated inside and out on all 3 levels for the holidays! 2 Gas BBQ grils.. Cabin Has Free Wi-Fi Throughout And It Even Works on both of the TWO DECKS!!! ADVANCED SECURITY SYSTEM!!! All sales and special offers are for new bookings only. Mini-golf is available onsite of the resort by the pools. Need some groceries awaiting you prior to your arrival or a special gift basket for the anniversary couple, flowers or Champagne? Just let us know and our Concierge service will provide them for you! Also, Why pay more for the same cabin With The Best Views In Bear Creek Crossing And Most Amenities?? Please feel free to compare prices/amenities! Location Location Location!!!! hot tub with BEAUTIFUL MOUNTAIN VIEW and privacy,60 inch wide screen and 50 INCH PLASMA TV. This luxury is stocked with board games,OVER 175 DVD's LIKE MINI BLOCKBUSTER, books, toys and videos, Free WIFI, security system, game room, pool table , 4 master suites, 4 1/2 bathrooms, bedside Jacuzzi. This luxury log cabin is always decorated for the holidays, huge kitchen with dishwasher, microwave, fully equipped for your holiday meals, huge refrigerator/freezer, large country dining room table. PROFESSIONAL POPCORN MAKER FOR YOUR ENTERTAINMENT VALUE WITH FREE POPCORN! CHILD WOODEN PLAY HOUSE ON DECK. The area is known as the 'Vacation Capital of the South' outdoor activities abound in the natural beauty that surrounds-Smoky Mountain National Park (most visited park in US), hiking, backpacking, swimming, white-water rafting, horseback riding, fishing, boating, helicopter tours, geming–this is truly an outdoor enthusiast's paradise. Close to the caves in Sevierville has one of America's most spectacular caverns. Also close to your luxury log cabin is Pigeon Forge with numerous amusement parks including Dollywood, Dollywood Splash Water Park, Wonderworks, many other museums, music, and entertainment dinner theatres, Wedding Chapels, numerous restaurants, go carts, miniature golf, bumper cars and outlet mall shopping. Then there is the quaint mountain town of Gatlinburg with specialty store shopping, skiing and chair lifts, skiing, haunted houses, aquarium, numerous restaurants, wedding chapels, and arts and crafts. Over the mountain is Cherokee Indian Reservation w/ Harrah's Casino. We require 50% down and 50% 60 days before check-in.